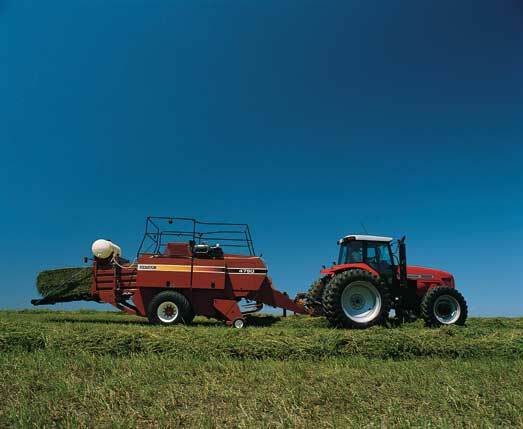 - Timing of baling hay is probably the most important concept of baling hay. Baling hay is a race against mother nature. The summer months are very spotty when considering rain. An operator needs to watch the weather before considering mowing a hay field. A large rain could ruin a hay field and the hay would be worthless. The hays value both in money and nutrients would be decreased. - Timing when the hay is baled is also very impotant. The hay should be baled before it is very brittle because it will lose leaves from the hay. Usually the hay is baled in the mid day because the hay is dry at that time. Towards evening the hay will dampen causing it to be tough for the baler to bale. - A baler is a implement pulled by a tractor, that packs the hay into a bale of either round or square then tyed to hold the hay togathor. 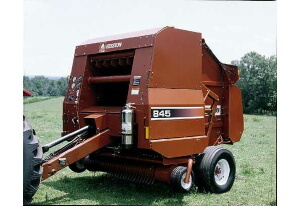 There are many different types of balers consistingof small square balers, large square balers, and round balers. 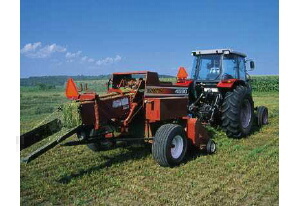 Small square balers are the most common type and the are usually done on the small operations. The large squre balers are a growing product because of efficiency and the ability to save labor. The round baler is a very efficeint way to bale hay but the bales are very had to haul in mass quantities because the are hard to stack on semi trailers.